The BLINKY example program toggles the LEDs on Port 3 and prints the text "HELLO" to the serial port COM0. The toggle speed of the LEDs depend on the input voltage of the AIN0 input. The BLINKY example project demonstrates assembling, compiling, linking, downloading, and debugging using the µVision IDE on the MCBXC800 board. The on-board LEDs make it easy to visually verify that the program loads and executes properly. The HyperTerm terminal emulator program makes it easy to verify serial output. 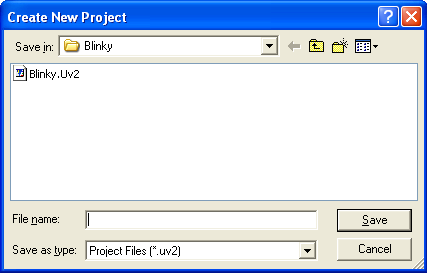 When the BLINKY project opens, the µVision Project Workspace window displays the source files that make up the project. The program setup is done with Infineon DAvE. START_XC.A51: CPU startup file for the Infineon XC800 devices. MAIN.C: application module that prints the text output, and toggles the LEDs. T01.C: timer interrupt service routines for the Timer 0. IO.C: configuration for the I/O Ports. UART.C: configuration for the serial interface. 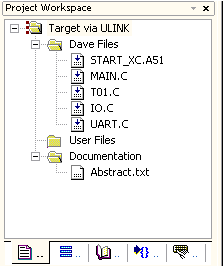 The Abstract.txt file contains documentation about the project. You may edit MAIN.C or review the source code. Double click on MAIN.C in the Files page of the Project Window. µVision loads and displays the contents in an editor window.